Local bike organizations recently signed on to a letter to Northern Virginia Transportation Authority and Virginia Department of Transportation asking them to "establish continuous and high-quality bicycle routes in each of Northern Virginia’s major transportation corridors." 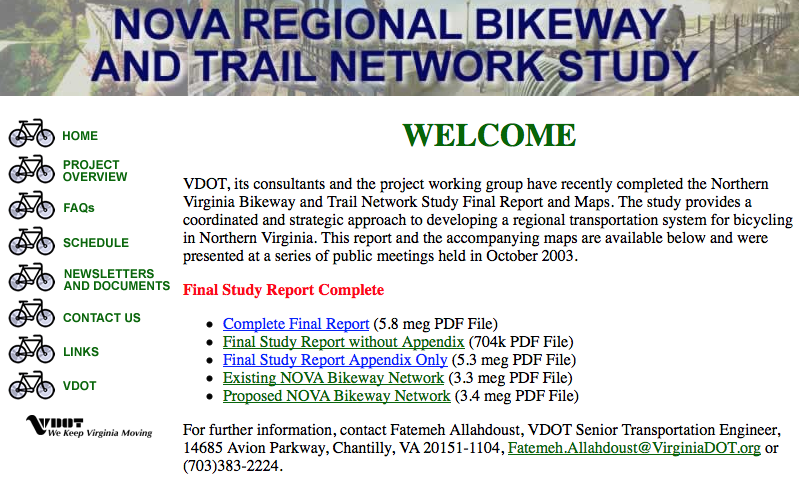 According to the letter, "VDOT and the localities have already identified much of the needed bicycling facilities in VDOT’s Northern Virginia Bikeway and Trail Network Study, released in 2003, and local plans. The VDOT study made excellent recommendations, but, unfortunately, very few have been implemented." The group also asked that "VDOT and/or NVTA establish a bicycle advisory committee for Northern Virginia that is focused on implementing this initiative." We hope to meet with NVTA and VDOT leaders to discuss these requests and determine next steps. Does anyone really think that bicycle facilities will take any significant traffic off the roads? Where is the money for this to come from? Any transportation funds spent on bicycles will further limit the money available for road maintenance. I fish for recreation and have to buy a license to, even though most of the time I am on private property. Hunters and boaters do the same. Any funds for bicycle facilities should be paid for by the users. Also, the same should apply for mass transit. Building good bike facilities where there is high potential for use does take traffic off the roads. If only a small percentage of traffic is reduced, congestion is reduced as well. Roads are only partially financed with user fees. With the new transportation funding that the VA legislature approved in 2013, the gas tax was reduced and the sales tax that everyone pays was raised to fund transportation projects. Road projects have always relied on local funding, especially secondary road and neighborhood streets. Bike projects are not expensive compared to road projects. Portland built their extensive bike network for the cost of 1 mile of highway construction. Fortunately many political leaders in this area know that we can't solve our transportation problems by building wider roads to facilitate more people driving (and parking). We need a mature transportation system that serves everyone, and that everyone pays for.